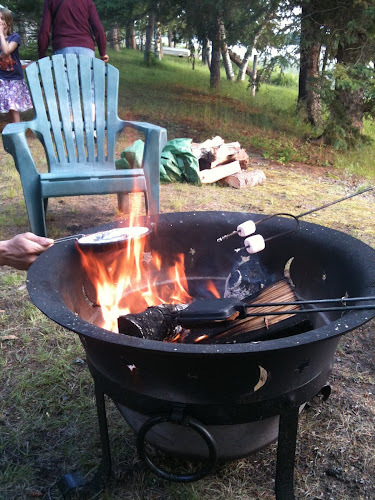 This week we went to stay at a cabin by the lake in Minnesota of course had to have a few treats over the campfire. As you can see in the photo, we have three campfire favorites going on: s'mores, toasted fruit pies made with two slices of bread and pie filling in a pie iron, and Jiffy Pop, which is not intended to be popped over the fire but a few folks had well practiced techniques. Mmm, it was all delicious! Do you have any campfire favorites? For the first night of camping we have brought left overs (Chinese food). All we had to do was reheat it and it was delicious. Potatoes wrapped in foil are always good. Fish with veggies and spices smothering it then wrapped in foil would be my favorite campfire food right after s'mores. Yum....we missed foil dinner night but that was a Boy Scout favorite of Justin's! Guess What We Made with This?